Lately, Sabana REIT has been getting a lot of attention when a small group of unitholders moved to kick out the manager for delivering poor performance since its IPO in 2010. Early investors who bought Sabana at an IPO price of S$1.05 are now sitting on huge losses – Sabana last traded at just 43 cents per share. If we look at the history, Sabana REIT isn’t alone. 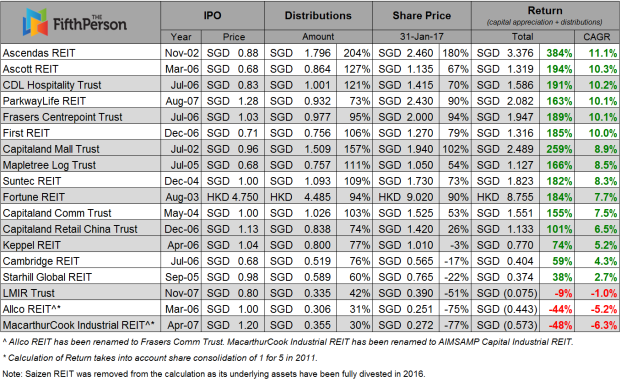 There are several other Singapore REITs (S-REITs) like Saizen REIT, MacarthurCook Industrial REIT and Allco REIT that have run into trouble before and caused a dent in Singapore’s REIT sector. Despite some casualties, Singapore’s REIT market remains vibrant – largely thanks to the majority of S-REITs that continue to deliver good results to income investors. In this article, we look at the performance of S-REITs with a listing history of at least 10 years. We wrote about the performance of S-REITs one year ago and this time around, we revisit the article by taking into account the latest share prices as at 31 Jan 2017 and dividends paid out to unitholders up to 2016. We also made several adjustments such as pre-consolidation shares and dividends to get a more precise and accurate picture. 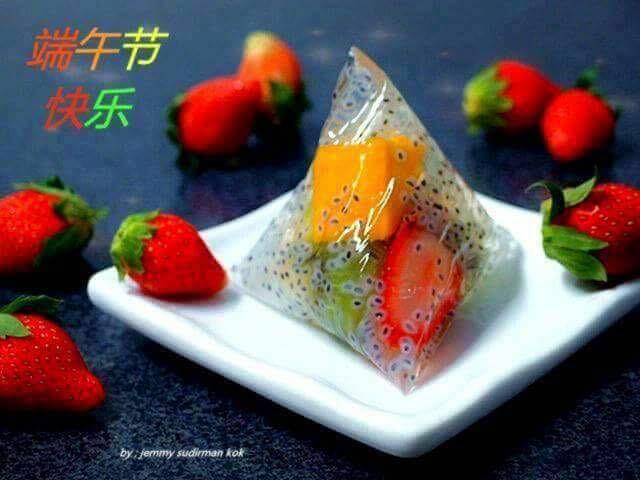 The 5th day of the 5th month in the Chinese calendar has been set as Duānwǔ jié 端午節 (Dragon Boat Festival) to remember the incident. Although there were versions of legends and stories that indicate Duan Wu has existed way before Qu Yuan's death, the tradition still carries on. 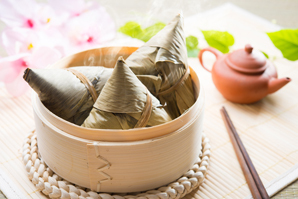 The rice dumplings (Zòngzi 粽子) are glutinous rice, or sticky rice in some countries like Thailand and Hong Kong wrapped in bamboo leaves, or other large leaves (lotus is one of the more commonly used leaves). 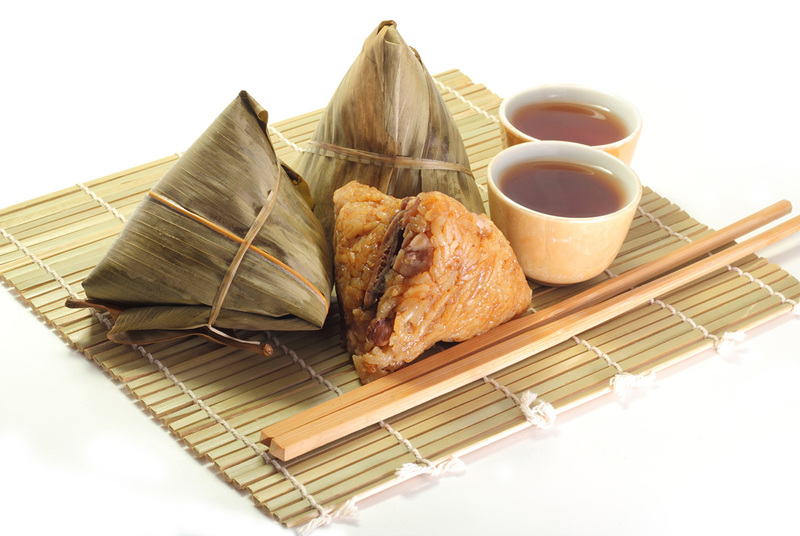 You can find all sorts of different fillings in the rice: pork, roast pork, chestnut, egg, salted egg, mushroom, red bean, or just simply without filling. 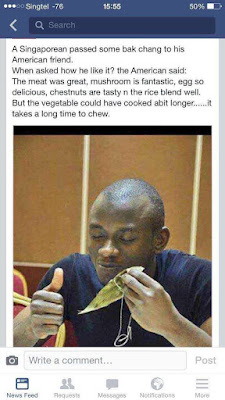 They could be just white rice dumpling (not pre-fried), or brown (pre-fried with soya sauce). Nowadays, you can buy Zòngzi almost everyday of the year, in restaurants or hawker stores in most oriental countries such as Singapore, Malaysia, Hong Kong, Taiwan, China, and other Asian countries where large amount of Chinese reside. Critics who suggest that Singapore should align more closely more with China so it would stop investing in competitive projects in neighbouring countries are drawing "a simplistic & flawed conclusion", Senior Minister of State Chee Hong Tat said on Fri (May 26). Speaking at the commencement ceremony of the Future China Advanced Leaders Programme, Mr Chee pointed out that Beijing is making investments in the region to enhance its connectivity and energy security, & that these decisions are based on China's own national interests. "Some people read media reports & are concerned about Singapore’s relations with China, & asked if Singapore should align more closely with China. A few have suggested that by doing so, China would not be investing in our neighbouring countries to compete with Singapore," he added. 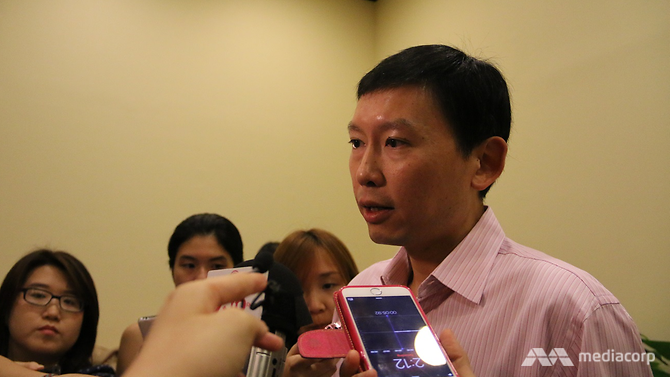 Singapore cannot take for granted the close relationship built up with China & must constantly work on enhancing its close bilateral cooperation with the country, Senior Minister of State for Communications and Information Chee Hong Tat said on Fri (May 26). Mr Chee made this point at the Future China Advanced Leaders Programme commencement ceremony, where he addressed concerns over recent media reports about Singapore’s relationship with China. Some media reports had noted that Prime Minister Lee Hsien Loong was not present at last week’s Belt and Road Forum in Beijing. Instead, Singapore was represented by National Development Minister and Second Finance Minister Lawrence Wong. It is in Singapore’s interest that China succeeds, says Senior Minister of State for Communications and Information (MCI), Chee Hong Tat. The minister made the remarks in his speech at the Future China Advanced Leaders Programme Commencement Ceremony at Mandarin Orchard Singapore on 26 May. 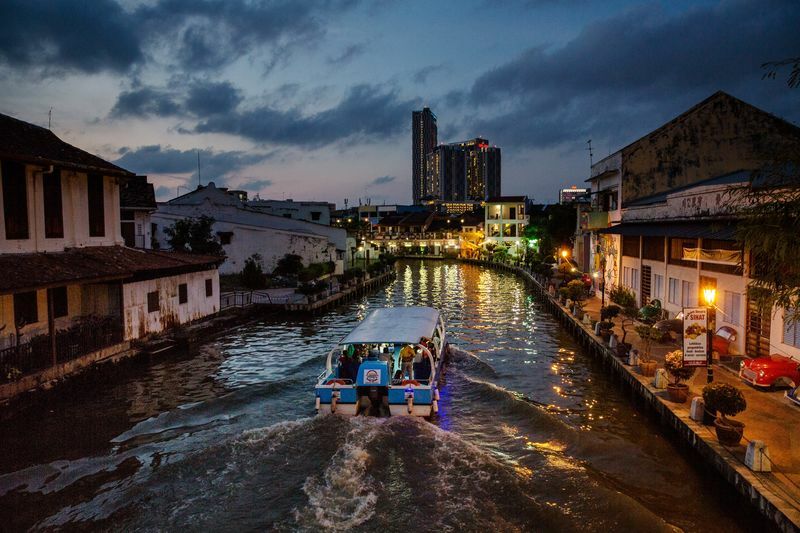 The Straits of Malacca have been a gateway for China for centuries in its quest for power. A story blended from Malaysian history and folklore says an emperor sent a princess called Hang Li Po to marry the Sultan of Malacca in the Ming Dynasty, offering a ship filled with gold needles. He also sent a blunt message. “For every gold needle, there is a subject. If you can count the number of needles, you will learn the true extent of my power,” the emperor reportedly said in a letter. Hundreds of years later, China is again seeking influence in Malaysia as it spreads its economic and military clout through Southeast Asia. It is investing billions in a $7.2 billion redevelopment that will see Malacca, long the haunt of Chinese traders, become a new deep sea port. Iskandar Malaysia: Why are the Chinese here? Malaysia's "gain" and Singapore's "loss"
When is Ramadan in 2017? Ramadan in 2017 will start on Saturday, the 27th of May (27/5/2017) and will continue for 30 days until Sunday, the 25th of June. Note that in the Muslim calendar, a holiday begins on the sunset of the previous day, so observing Muslims will celebrate Ramadan on the sunset of Friday, the 26th of May. 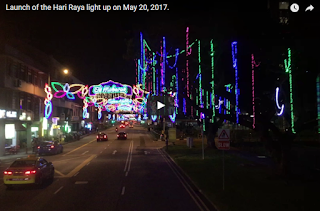 The streets of Geylang Serai were illuminated with thousands of colored lights as part of the annual Hari Raya light-up, officially launched on Sat (May 20) evening. The centrepiece for this year's light-up is a kampung house spanning the road & flanked by giant leaves designed to look like the traditional Malay songket brocade. Other installations include a giant 4.4m Kelantanese kite and 12m kelong & sampan. Ramadan is the ninth month* of the Muslim calendar. It is during this month that Muslims fast. During the Fast of Ramadan strict restraints are placed on the daily lives of Muslims. They are not allowed to eat or drink during the daylight hours. Smoking and sexual relations are also forbidden during fasting. The holiday of Eid ul-Fitr marks the end of Ramadan and the start of the next lunar month, Shawwal. This day is declared when the crescent new moon has been sighted or if sighting of the moon is not possible due to the weather, the completion of 30 days of fasting. Before the feasting, there’s the fasting … And we’ve got a list of everything you need to know about Ramadan and Hari Raya Puasa. Hari Raya Puasa is an integral part of Singapore culture, and it’s a time for Muslims to focus on familial bonds. But before we get to the good food and celebrations, there is first a month of abstinence known as Ramadan. What is Ramadan? It is the ninth month in the Islamic calendar and a period of fasting prior to the Hari Raya Puasa festivities. During Ramadan (this year, it will last from June 16 to July 16), the Muslim community refrains from eating or drinking from dawn until dusk. It is also a time for physical and spiritual discipline and charity, and is considered to be an auspicious month for Muslims. So what then, is Hari Raya Puasa? Contrary to popular belief, it is not the start of a Muslim New Year, but a celebration to mark the end of the fasting month. How does a typical day of fasting go? The day begins with a pre-dawn meal known as sahur, followed by the fast until sunset, when families and friends gather for the iftar. This is when the fast is broken with dates before a full meal. 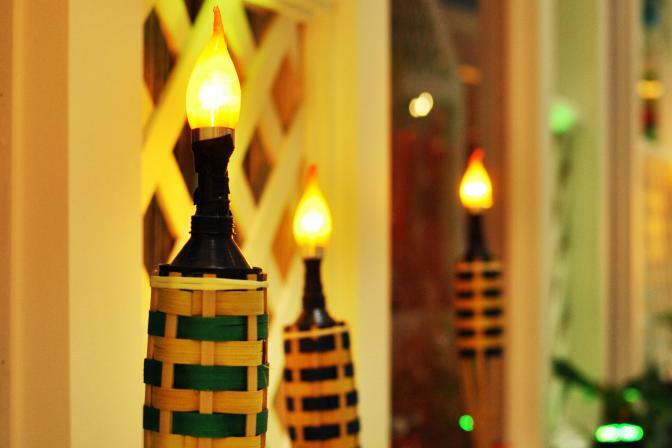 What are some of the traditions practiced during Hari Raya Puasa? On the morning of Hari Raya Puasa, members of the family seek forgiveness from their elders after prayers at the mosque, and young children are given little green packets of money, similar to the Chinese hong bao (red packet). Some families visit the cemetery on the morning of Hari Raya Puasa to pay their respects to departed relatives and loved ones. You’ll see families dressed in outfits of the same colour, which is a common way of displaying unity. Should I bring a gift if I’m invited to a friend’s home for Hari Raya Puasa? While these are not required, you can bring along a small gift, or buah tangan, if you like. Recommended gift ideas include desserts such as cookies, cakes or traditional Malay kueh to share with visitors. You can find these at bakeries or supermarkets. But steer clear of all things alcohol and, of course, avoid pork. 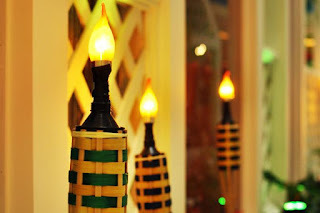 Experience Ramadan - These two places are the best to soak in the Ramadan and Hari Raya atmosphere. Geylang Serai is transformed into a colourful world of food and fabric during the month of Ramadan. Besides textiles, Geylang is a vibrant foodie haven which houses a vast selection of savoury snacks and Malay street food like kuih gulung (green crepe with sweet coconut filling), keropok lekor (fish crackers), pisang goring (banana fritters), kebabs and the ever popular Ramly burger and Roti John (thick omelette sandwich) which hail from Malaysia. 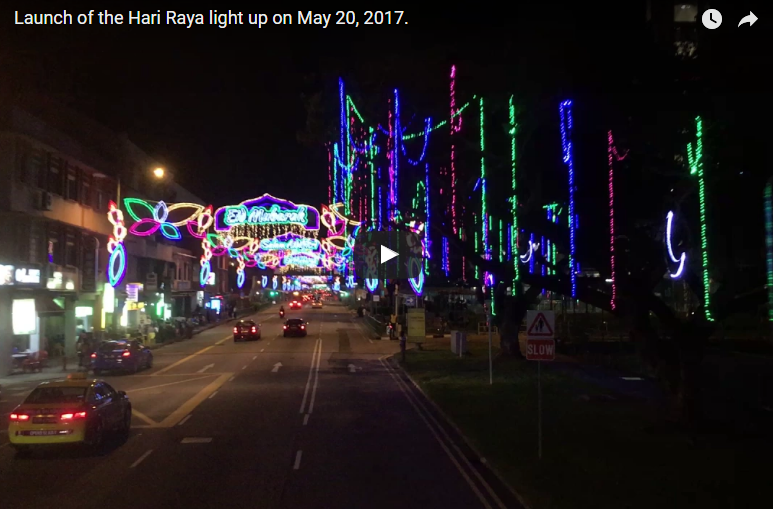 Look out for glittering lights and Hari Raya street decorations at Geylang Serai from June 13 to July 16! To buy traditional Malay outfits, head for Arab Street, which has beautiful fabrics and ready-made baju kurung for women, and the baju Melayu for men. It is a big week for the world’s 1.6 billion Muslims - 22 per cent of the entire global population - as they get ready for the holy month of Ramadan. The annual period will see prayer, fasting, and giving to charity become the focus of their everyday lives for an entire month. Ramadan is the ninth month of Islam’s lunar calendar, a system which sees each month begin at the sighting of the new moon. According to some scholars, the month is said to be the one in which the Qur'an was first revealed, making it the holiest and most sacred month for Muslims. It is the period when Muslims fast every day from sunrise to sunset, and is one of the five pillars - or duties - of Islam. Not only do Muslims abstain from food and drink, it is also a time of deep contemplation and prayer to Allah, and also charitable generosity. All able-bodied Muslims are required to take part in Ramadan. Although there is some debate over the age at which young Muslims should begin to take part, it is typically at around ten to 12-years-old. Singapore will acquire two more air-independent propulsion (AIP)-equipped Type 218SG diesel-electric submarines, the Ministry of Defence (MINDEF) announced during the IMDEX 2017 exhibition in Singapore. The deal, which was signed with ThyssenKrupp Marine Systems (TKMS), will also include crew training in Germany as well as logistics support. The country already has two Type 218SG submarines - ordered in 2013 - under construction at TKMS' Kiel facility, bringing the total number of boats on order to four. "In addition to the two previously announced, the Republic of Singapore Navy [RSN] will acquire two more Type 218SG submarines to replace its older submarines, with an expected delivery from 2024 onwards," Defence Minister Ng Eng Hen said during the exhibition's opening address, noting that the first two boats are expected to be delivered to the RSN in 2021 and 2022 respectively. As maritime trade in Asia Pacific grows, regional states there have all increased the strength of their navies, with naval budgets in the region expected to surge by 60 percent through 2020. News website TodayOnline reported the latest additions would bring the total number of type 218 submarines in Singapore's fleet to four. 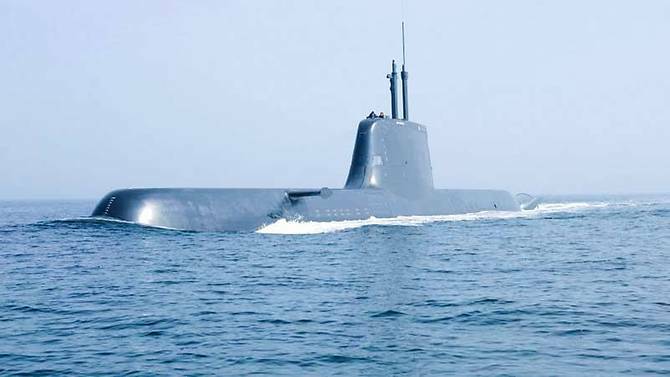 Singapore will acquire two new Type 218SG submarines as part of the Republic of Singapore Navy (RSN)'s modernization effort, said the Ministry of Defence (MINDEF) on Tuesday in a press release. The new submarines will replace the older submarines, with an expected delivery from 2024 onwards, announced Minister for Defence Ng Eng Hen at the opening ceremony of the International Maritime Defence Exhibition and Conference Asia 2017. MINDEF added that the Type 218SG submarines incorporate design innovation and advanced maintenance and engineering concepts to optimize training, operation and maintenance costs. Republic of Singapore Navy (RSN) will acquire two more Type-218SG submarines to replace its older submarines, with an expected delivery from 2024 onwards. At steady state, the four Type-218SGs in service will complement each other in maintenance, logistics and operations, and have better capabilities to protect our SLOCs," said Dr Ng. This is the second batch of submarines purchased by the city-state. The first two Type 218SG submarines, which were acquired in 2013, have commenced construction following their steel-cutting in 2014. They are projected for delivery from 2021 and 2022. They are part of the RSN’s submarine force renewal programme to meet operational requirements. The new submarines are part of the RSN's approach to long-term capability development. The Type 218SG submarines incorporate design innovation and advanced maintenance and engineering concepts to optimise training, operation and maintenance costs. They will also be equipped with significantly improved capabilities like modern combat systems and Air Independent Propulsion systems. 2 more Type-218SG submarines from Germany's ThyssenKrupp Marine Systems will be added to the Republic of Singapore Navy’s (RSN) fleet from 2024, Defence Minister Ng Eng Hen announced at this year's International Maritime Defence Exhibition and Conference (IMDEX) Asia on Tuesday (May 16). They will join another 2 such submarines previously announced in 2013 – to be delivered in 2021 and 2022, respectively. These are expected to replace older submarines in the Navy’s fleet. According to a statement from the Ministry of Defence (MINDEF), the new submarines boast design innovations to optimise training, operation & maintenance costs. They will also be equipped with "significantly improved capabilities" like modern combat systems & Air Independent Propulsion systems. 2 more German-made Type 218SG submarines will join the Republic of Singapore Navy's (RSN) fleet from 2024 amidst the backdrop of a regional naval expansion, Defence Minister Ng Eng Hen announced at the International Maritime Defence Exhibition on Tuesday (May 16). As maritime trade in Asia-Pacific grows, regional countries have all increased the strength of their navies, Dr Ng noted, with naval budgets in the Asia-Pacific region expected to increase by 60% through 2020. It is in this environment that the RSN has to keep pace with the modernisation & growth of navies in Asia, Dr Ng said. The Republic of Singapore Navy (RSN) has retired two Challenger (ex-Sjöormen)-class submarines, the country's Ministry of Defence (MINDEF) announced on 11 March. The vessels, RSS Centurion and RSS Challenger , were originally in service with the Royal Swedish Navy (RSwN) as HMS Sjöormen and HMS Sjöbjörnen and re-launched in May 1999 and September 1997 respectively. 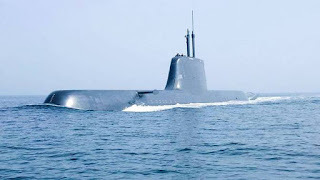 Singapore acquired four Type A 12 Sjöormen-class submarines in the mid-1990s to give the RSN its first experience of submarine operations. The 51 m vessels, which can reach a top speed of 20 kt while submerged, are equipped with four 533 mm and two 400 mm torpedo tubes, according to IHS Jane's Fighting Ships . A 2nd car caught fire on Friday (April 27), this time along the Ayer Rajah Expressway (AYE). 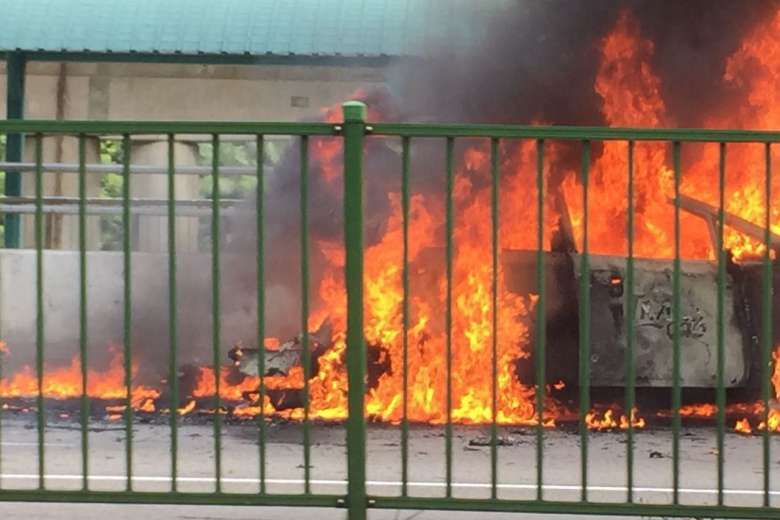 The blaze engulfed a vehicle on the leftmost lane of AYE, towards Tuas, after the Buona Vista Exit. Officers from the Singapore Civil Defence Force were alerted to the fire at about 8.50pm and extinguished it within 5 minutes with a water jet and a hose reel. 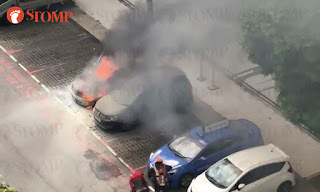 A car caught fire in Adam Road on Friday evening (Apr 27), with officers from the Singapore Civil Defence Force (SCDF) putting out the fire in 5 minutes. A video posted on Facebook by William Yong shows the vehicle blazing on the leftmost lane, by a bus stop. SCDF said it was alerted to the vehicle fire in Adam Road towards Farrer Road at about 7.30pm. 2 cars caught fire on Friday evening (Apr 28), one at Adam Road and another along the Ayer Rajah Expressway (AYE). 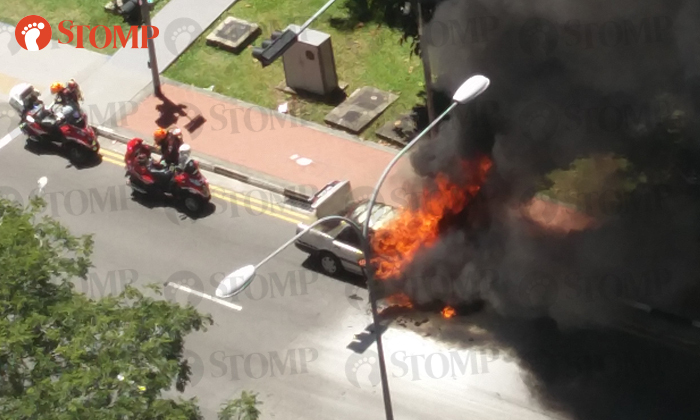 Stompers Yazid and David alerted Stomp to a car that had caught fire near a bus stop along Adam Road. In response to media queries, the Singapore Civil Defence Force (SCDF) said it was alerted to a vehicle fire at Adam Road towards Farrer Road at about 7.30pm. 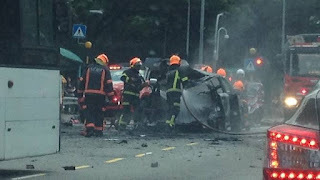 A car caught fire along Balestier Road on Thu afternoon (May 24). Stomper Abhijit, a resident in the area, contributed photos showing Singapore Civil Defence Force (SCDF) officers at the scene. He said: "Firemen did their best to subdue the fire, but it took serious effort and additional support was called upon. A car burst into flames on the Pan Island Expressway (PIE) on Wed night (Jan 10) following an accident that is believed to involve 2 other cars. 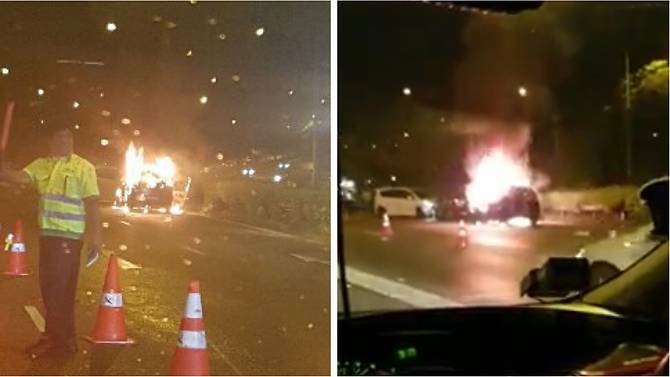 The Singapore Civil Defence Force (SCDF) said they were alerted to a vehicle fire along PIE towards Tuas after the Clementi Ave 6 exit at 8.55pm, and extinguished the fire using a water jet. There were no reported injuries, said SCDF, adding that the cause of fire is under investigation. A video uploaded by Facebook user Mohd Irwan Rashid showed one car engulfed completely by fire on the right lane. 2 other cars, which appear to have collided head-on, were just in front of the vehicle on fire. An exit lane on the East Coast Parkway (ECP) has been closed after a private bus travelling towards Changi caught fire at around 2pm on Sunday (Jan 7) afternoon. There are no reported injuries as a result of the incident. According to the Singapore Civil Defence Force (SCDF), the fire involved the engine compartment of the bus, & firefighters extinguished it using a water jet. 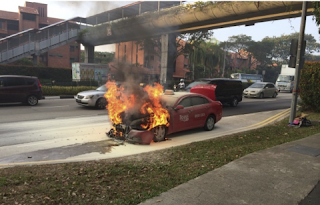 A car burst into flames along Lornie Road on Wed morning (Oct 18), causing heavy traffic. The Singapore Civil Defence Force (SCDF) said it received a call for assistance along Lornie Road, towards Upper Thomson, at about 9:18am. It sent 2 fire engines and 1 fire bike to the scene. The fire, which involved the car's engine compartment, was extinguished by SCDF using 2 water jets. A lorry that caught fire on Lornie Road yesterday morning caused a 3-hour traffic jam that extended all the way to Braddell Road at one point. No one was injured in the incident, with firefighters putting out the flames with a hosereel, said the Singapore Civil Defence Force (SCDF). Motorists & commuters were first alerted to the incident at 7:31am via the traffic website, One Motoring. 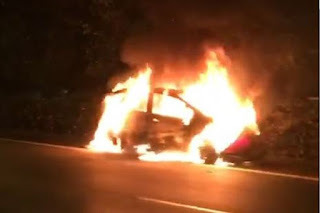 A car caught on fire after an accident on Sat (Aug 12), prompting the closure of the Havelock Road exit leading out of the Central Expressway (CTE). Traffic from the CTE towards the Ayer Rajah Expressway (AYE) is still open as the lanes leading there are passable, said the police. An update by the police on Facebook around 11:30pm said that all lanes were finally passable. A car caught fire at a carpark outside Block 534 Bedok North Street 3 on Sat (Sep 9), but no injuries were reported. The Singapore Civil Defence Force (SCDF) said it was alerted to the incident at about 10.35am & dispatched a fire engine, a red rhino and two firebikes. 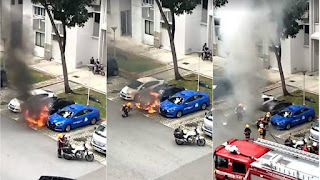 A video on Facebook page Our Singapore shows flames & thick smoke rising from the bonnet of a black car that was parked between a white car and a blue ComfortDelGro taxi. A car caught fire today in the carpark of Block 533, Bedok North Street 3 today (Sept 9) at about 2.30pm. Stomper Douglas received a video of the incident from a WhatsApp group and forwarded it to Stomp. In the video, the bonnet of a black car was seen engulfed in flames. A video that circulated on social media showed a red taxi on fire followed by an explosion at the front of the vehicle. It is believed the taxi driver escaped unhurt & there were no other reported injuries. The fire, which involved the engine compartment of the taxi, was extinguished by 2 members of the public using a hosereel before The Singapore Civil Defence Force (SCDF) arrived. 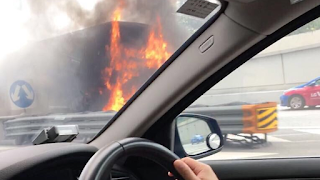 A taxi travelling through the Kallang-Paya Lebar Expressway (KPE) tunnel towards Tampines Expressway (TPE) caught fire & exploded during the evening rush hour on Tuesday (Aug 29). According to the Singapore Civil Defence Force (SCDF), they were alerted to the fire, which involved the engine compartment of a Trans-Cab taxi, at 7pm. A car went from a fiery fireball to a smoldering wreck yesterday at Block 167, Bedok South Avenue 3. The Singapore Civil Defence Force (SCDF) confirmed that it responded to the scene of the fire at about 5PM yesterday. The fire was put out by a SCDF firefighter with a hose reel. No one was injured. Investigations are ongoing on how the fire started. Stompers Dervin and Krish R alerted Stomp to a car that caught fire today (Feb 10) at Singapore General Hospital's (SGH) carpark. According to Stomper Krish R, the fire took place in front of Tower Block A. Both Stompers sent us videos of the incident, which took place around 4.30pm. A car caught fire on Monday (Jul 24) after it crashed into a centre divider along Airport Boulevard. The Singapore Civil Defence Force (SCDF) said it was alerted to the accident at about 4pm and dispatched a fire engine, a Red Rhino, 2 fire bikes & 2 ambulances to the scene. The five people who had been in the vehicle were taken to Changi General Hospital with minor injuries, SCDF added. Uber knowingly rented recalled Honda sports utility vehicles to its drivers in Singapore, at least one of which caught fire, according to a report by the Wall Street Journal. The paper reported Uber's Singapore office bought more than 1,000 Honda Vezel sports utility vehicles to rent to its drivers there. The cars contained a faulty electrical part that could catch on fire and Honda had recalled in Japan and elsewhere. There had been at least six reports of fires in the Vezel. As soon as Uber learned of its rented Honda Vezel catching fire, "we took swift action to fix the problem, in close coordination with Singapore’s Land Transport Authority as well as technical experts," Uber said in a statment. "But we acknowledge we could have done more—and we have done so." Honda Motor Co. will conduct at least the sixth round of major recalls involving its top-selling Fit compact in less than three years, as the automaker struggles to move past the quality woes that contributed to a change in chief executive officers. The company will recall more than 283,000 Fits and Vezel crossovers after reports of six fires related to a control systems flaw and two collisions linked to a power steering defect, said transport ministry official Yuichi Yamamoto. None of the incidents resulted in death or injury, he said. Persistent recalls of the Fit and Vezel that first began in October 2013 were among quality woes that led former President Takanobu Ito to abandon a global sales target before resigning the position. His successor, Takahiro Hachigo, has reshuffled top management and consolidated responsibility for product planning and evaluation, ceding more control back to the company’s overwhelmed research and development division. A taxi caught fire just outside ride-hailing firm Grab's offices at Midview City on Sunday (Jun 11). No one was injured in the incident. 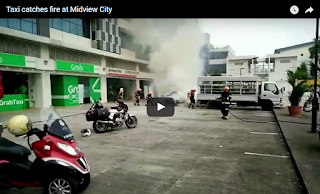 The S'pore Civil Defence Force (SCDF) said it was alerted to the fire at 34 Sin Ming Lane at around 8:30am and dispatched two fire engines and two fire bikes. It was extinguished using 2 hose reels and a compress air foam backpack. Owners of private cars fitted with compressed natural gas (CNG) cylinders will be required to send their vehicles for inspection by Jun 9, announced the Land Transport Authority (LTA) on Wed (May 24). The cost of the inspection will be borne by LTA. This is to safeguard public safety, said the authority, after 2 recent incidents which saw taxis with CNG cylinders catch fire. A car in an Ang Mo Kio carpark ended up a blackened heap after it caught fire on its own on 4 October 2016 afternoon. The Singapore Civil Defence Force (SCDF) was alerted to the fire at Block 609, Ang Mo Kio Avenue 4, at 4.38pm. The blaze in the engine compartment was extinguished using a water jet and a fire extinguisher. Residents near the block said they heard loud bangs as the car burned. There were burn marks on a lorry and a car which were parked next to the burning car. Vehicle fires are usually caused by overheating or electrical problems but explosions are rare, said safety experts. 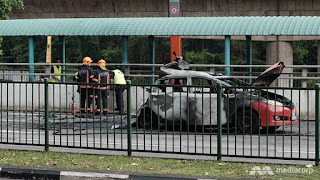 On Sunday, a Trans-Cab taxi that operated on compressed natural gas (CNG) and petrol caught fire and exploded in Commonwealth Avenue opposite Buona Vista MRT station while firefighters were fighting the blaze. In what is now becoming a common theme, another car caught fire, this time at Airport Boulevard on Thursday morning. SCDF reported that they managed to put out the fire using two water jets, and that occupants of the car had managed to escape before the car burst into flames. An eyewitness said that he was dropping off his passenger at Terminal 1 when he saw the car 'explode'. Smoke was reportedly seen about 50 m away. He then said that the car on front of him slowed down, and when he passed by the burning car, he could feel the heat even from his taxi. A man and a woman emerged from the burning taxi and managed to run away. This incident is a latest in a series of fires affecting cars. 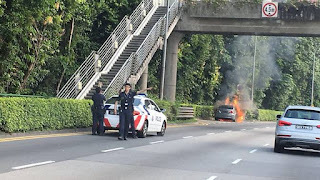 A Volkswagen Golf hatchback caught fire along the Pan-Island Expressway towards Jurong, near the Toa Payoh Lorong 6 exit, on Monday afternoon. 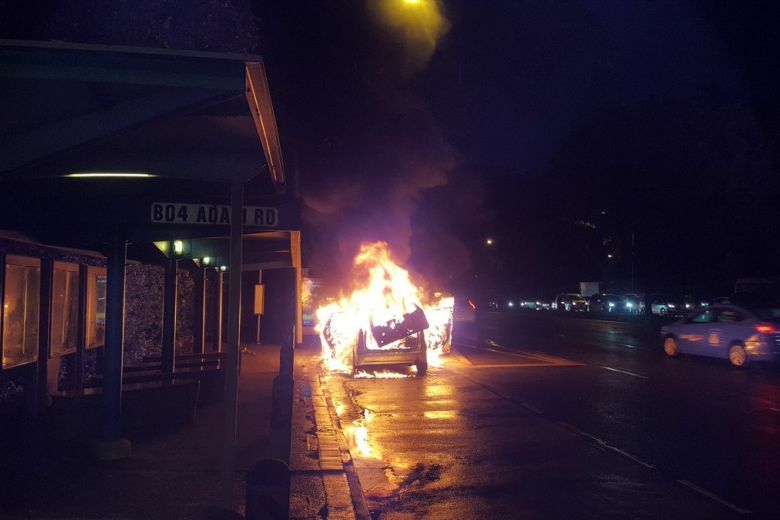 A car caught fire at Woodlands Drive 50 last Friday evening, and 2 TransCab taxis were also involved in fires - one at Marymount Road on Monday and one along Commonwealth Avenue on April 30. When it happens once, it’s a freak occurrence. When it happens twice, it’s unlucky. But what if it happens more than twice? It’s either a curse, or something has seriously gone wrong somewhere. 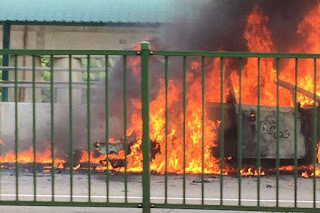 On Monday (May 22) afternoon, a Trans-Cab taxi caught fire on Marymount Road, Today reported — the 2nd time in just a month that a cab from that company has erupted in flames after an accident. 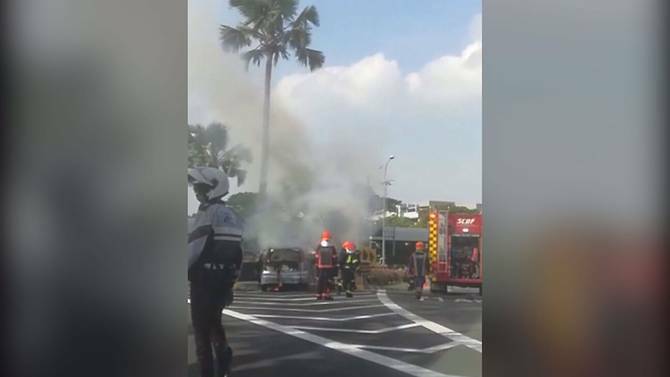 A Trans-Cab taxi caught fire along Marymount Road near the junction of Sin Ming Avenue after it was involved in an accident on Mon afternoon (May 22). The Land Transport Authority (LTA) first tweeted about the accident at 1.09pm. It advised motorists to avoid the right lane. When TODAY arrived at the scene at around 2:30pm, Singapore Civil Defence Force (SCDF) officers had put out the fire. 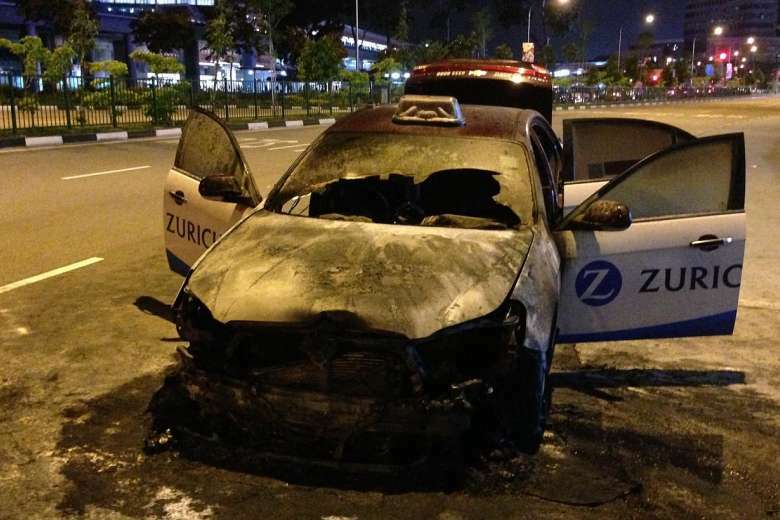 The taxi driver, a man in his 50s, suffered burn injuries & was sent to the Singapore General Hospital, SCDF said. A taxi caught fire and exploded on Commonwealth Avenue, near Buona Vista MRT station, on Sunday (Apr 30), injuring 4 people including a firefighter. The taxi appears to belong to operator Trans-Cab. The Singapore Civil Defence Force (SCDF) said it was alerted to the fire along Commonwealth Avenue, near the junction with North Buona Vista Road, at about 2.15pm. Stomper Wan saw that a Volksagen Jette had caught fire at the Basement 1 level of a carpark at Block 310B Punggol Waterway yesterday (Nov 26) at 8.45am. In a photo sent in by the stomper, another car was damaged as well. "An Audi A4 which was parked beside the Volkswagen was also affected," said Wan. 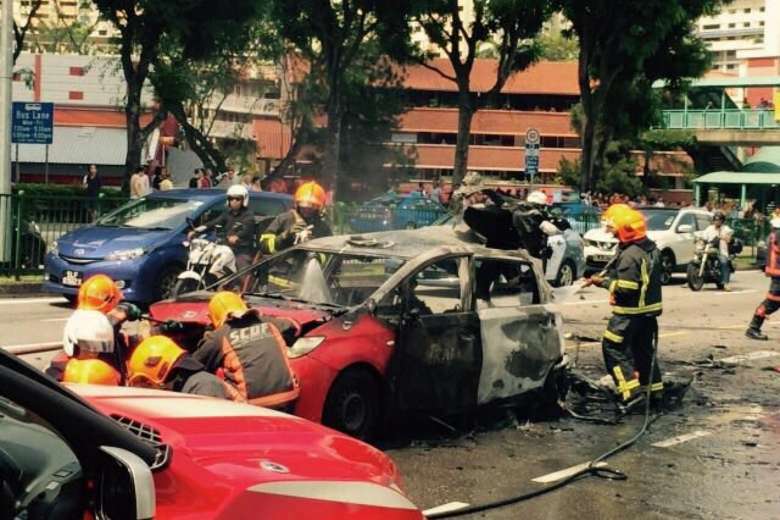 4 men, including a S'pore Civil Defence Force (SCDF) officer, were injured after a Trans-Cab taxi exploded on Commonwealth Avenue opposite Buona Vista MRT station on Sunday (April 30) afternoon. Preliminary investigations by the SCDF and the Police revealed that the likely cause of the explosion was a road traffic accident that had happened several minutes ago. At about 2.15pm, the Police were alerted to a traffic accident on involving a taxi & a car. The taxi subsequently caught fire. Four people were injured when a Trans-Cab taxi caught fire and exploded along Commonwealth Avenue, close to Buona Vista MRT station, on Sunday (30 April) afternoon. Police were alerted to a traffic accident in the area at 2.15pm involving a taxi and a car, said the Singapore Police Force (SPF) in a Facebook post. “The taxi subsequently caught fire and there was an explosion. Four men suffered minor burn injuries and were conveyed to the National University Hospital, including an SCDF officer,” said the SPF in its post. 4 men, including a Singapore Civil Defence Force (SCDF) officer, were injured. Preliminary investigations by the SCDF and the Police revealed that the likely cause of the explosion was a road traffic accident that had happened several minutes before. Police said that they were alerted at about 2.15pm to a traffic accident involving a taxi and a car. The taxi subsequently caught fire. It then exploded. Friday Evening was a terrifying day for me. I booked grabcar to go home today. The car i took exploded right infront of my eyes. Driver was confused and Luckily driver told me to get out asap as he told me that his car broke down and we already saw the smoke coming out from the front. As soon as i walked out, the car was flaming bit by bit and it blasted. SCDF came asap as fast as 5 mins when it happened. By now you would’ve read that a Nissan exploded in a multi-storey car park in Bukit Batok on Wednesday (Apr. 26) evening. Videos of the aftermath of the incident was circulated widely with one person, believed to be the driver of the car, being shown badly burnt but conscious sitting in the vicinity. Butane gas canisters were reportedly found at the scene. A 32-yr-old man was taken to hospital after an explosion involving a car at Bukit Batok Street 24 on Wed (Apr 26). Police said they were alerted to the incident at a car park at Block 290H at 6.28pm. The man was conscious when he was taken to the Singapore General Hospital. Portable butane gas canisters were found at the scene, police said, adding that the cause of the explosion is still under investigation. A car at an Ang Mo Kio carpark ended up a blackened heap after it caught fire spontaneously on Tuesday (Oct 4) afternoon. No one was injured in the incident, the Singapore Civil Defence Force (SCDF) said. SCDF was alerted of the fire at Block 609, Ang Mo Kio Avenue 4, at 4.38pm. An accident on the Bukit Timah Expressway (BKE) on Friday afternoon left a couple injured and their car on fire. Together with the truck driver, who wanted to be known as Mr Yang, 40, Mr Lim crawled into the car from the rear and managed to carry the unconscious driver to safety. Thankfully, both the driver and passenger were pulled to safety by two motorists before the car exploded into flames, reported the Shin Min Daily News. He was taking a break with his colleagues at about 3.30pm on Sun (March 26) when he saw smoke coming out from the bonnet of a nearby car. What horrified Mr Ramzie Ramzan, 38, an audio & visual technician with Republic Polytechnic (RP), was a couple with their young daughter, believed to be about six or seven years old, inside the car, which was on Woodlands Avenue 9. An SMRT taxi caught fire on Tuesday evening in front of Block 131 Jurong Gateway Road. The S'pore Civil Defence Force received a call at 7.59pm and dispatched one fire engine, one Red Rhino, and 2 fire bikes. Upon arrival, the taxi's engine compartment was in flames, and the fire was extinguished within 10 minutes. A car was engulfed in flames on the Marina Coastal Expressway (MCE). Photos of the burning car went viral after being shared on the Connextaxi Facebook page. The images show the interior of the car burning. A thick column of smoke can also be seen filling the tunnel. About 30 people were evacuated from a mall in Clementi on Sunday (April 9) afternoon after a car caught fire in the carpark. The fire occurred at about 1.15pm at the entrance of the carpark at The Clementi Mall, Lianhe Wanbao reported on Monday (April 10). The vehicle caught fire suddenly as it was entering the carpark at the basement, and the driver escaped just in time, Wanbao said. Is this near Mandai Tekong park? Yeah it was, the T-lane junction before Woodlands Primary School there. One car caught fire on East Coast Parkway (ECP) and another on the Ayer-Rajah Expressway (AYE) in separate incidents on Thursday. In the first fire, a car burst into flames along the ECP towards Changi Airport near the Bayshore Road exit around 7am, leaving the driver with mild injuries. A spokesman for the Singapore Civil Defence Force (SCDF) said fire vehicles were sent to put out the fire. The car’s driver, who sustained abrasions on his chin and forearm, was sent by ambulance to Changi General Hospital. The second incident occurred along the AYE towards Tuas near the Jurong Pier Road exit later in the day around noon. 2 cars caught fire within the space of about an hour on Mon evening (June 6) in different parts of S'pore. The 1st incident occured at about 5pm involving a white car on fire near the junction of Farrer Road and Holland Road. The Singapore Civil Defence Force (SCDF) extinguished the fire, which originated in the car’s engine compartment, with one water jet. At about 6.12pm, the SCDF was then alerted to the 2nd incident. 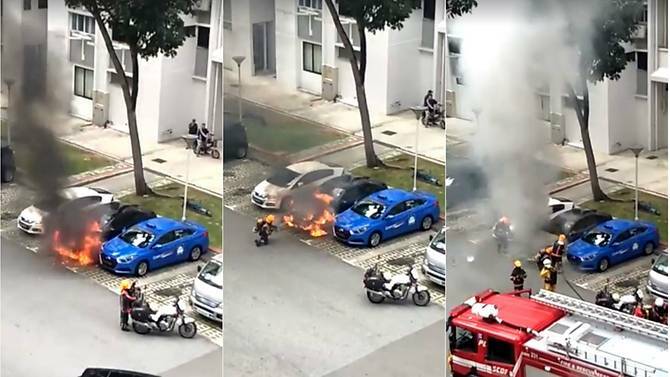 This time, it was a blue car whose engine compartment had caught fire at the junction of Ang Mo Kio Avenue 1 and 8. 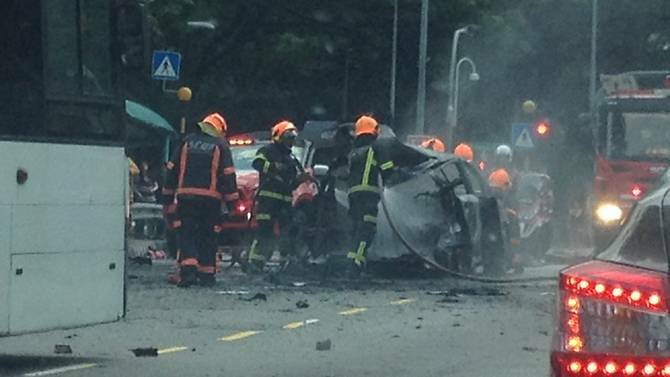 4 men, including a S'pore Civil Defence Force (SCDF) officer, were injured after a Trans-Cab taxi exploded on Commonwealth Avenue opposite Buona Vista MRT station on Sun (Apr 30) afternoon. Preliminary investigations by the SCDF & the Police revealed that the likely cause of the explosion was a road traffic accident that had happened several minutes ago. At about 2.15pm, the Police were alerted to a traffic accident on involving a taxi and a car. The taxi subsequently caught fire. According to a spokesperson from the SCDF, no injuries were reported. TRS reader Sang Ngiap managed to snap photos of the burning taxi as he was passing by on a bus, while TRS reader Giselle and Tasha sent in photos of the charred wreckage. Taxi on fire opposite Ten Mile Junction mall. No one was hurt, and the taxi driver was standing nearby. TRS readers Lim, Ame, Susan, Kris, Natalie and Desmondsent in photos of the taxi in flames as well as when the SCDF personnel arrived at the scene and when the fire was being put out. Susan said that the incident caused a heavy jam at around 8 am. Ame said that it seems to have be caused by the engine overheating, and that a strong burning plastic odor filled the air. Stomper Roger saw a cleaning buggy go up in flames on Aug 16 at a carpark in front of Block 324, Ubi Avenue 1. Photos sent by the Stomper show the burning vehicle and Singapore Civil Defence Force (SCDF) personnel putting out the fire. The buggy was almost completely burnt. Roger reported hearing a small explosion as it was burning. A car in an Ang Mo Kio carpark ended up a blackened heap after it caught fire on its own on Tuesday afternoon. It was the third such case in four days. 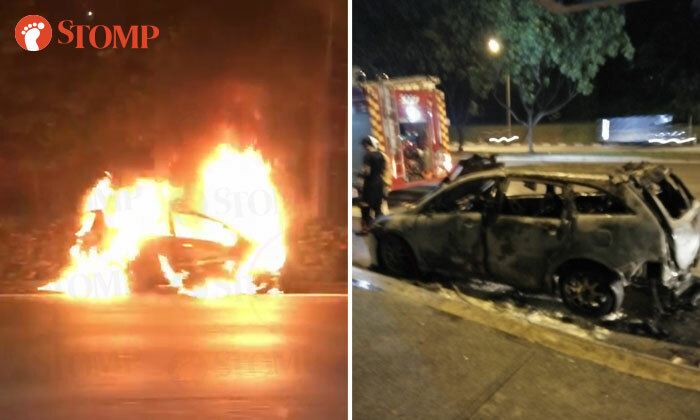 One car went up in flames in a Tampines carpark in the early hours of Sunday morning, and a similar case was reported in a Woodlands carpark on Saturday evening. No one was injured in the incidents, the Singapore Civil Defence Force (SCDF) said. It was alerted to the fire at Block 609, Ang Mo Kio Avenue 4, at 4:38pm. The blaze in the engine compartment was extinguished using a water jet and a fire extinguisher. Residents near the block said they heard loud bangs as the car burned, Shin Min Daily News reported. There were burn marks on a lorry and a car which were parked next to the burning car, the report added. On Sunday morning, the SCDF was called to extinguish another car fire in an open carpark around Block 464, Tampines Street 44. The fire occurred at about 4:40am. And at about 6:20pm on Saturday, a car parked at Block 149, Woodlands Street 13, also caught fire. Both fires were put out with a water jet. The fire started from the engine compartment and was extinguished using one water jet and a fire extinguisher. Burn marks on a lorry and a car parking beside the burning car could be seen. Stomper Afandi saw a car go up in flames at 9.30am on Sat (July 9) at Bukit Merah Central. The Stomper said no one was injured as everyone managed to get out of the car in time. "An SCDF motorbike reached the location at 9.45am," said Afandi. Vehicles on the KPE were forced to turn around or get stuck in a jam after a car caught fire yesterday (July 5) night. Stompers Lim, Lawrence and Anonymous alerted Stomp to the incident and sent us photos of the incident. A video of the jam that occurred because the car going up in flames was posted on Roads.sg. The clip's caption also explained that the fire was put out as of 10.30pm. Singapore Business Review normally reports on business matters but editor-in-chief Tim Charlton was taking an evening run in Whampoa when he spotted this crazy fire taking place. It looked like it started off in one car, says Charlton, before spreading to others. First htere were pops and explosions and we ran. When the fire brigade came, the fire had started streaming down the drainage canal towards the river, shooting up several meters into the air like crazy geyser-like explosions, added Charlton. He does not know what the cause of the fire was, and the Singapore fire force was able to put it out within 20 minutes. Stomper Fitzy, Jeffery, Steve and John came across a black car on fire at Jalan Muhibbah along MacPherson Road yesterday (Mar 18) at around 6.30pm. They took videos of the incident and sent it to Stomp. 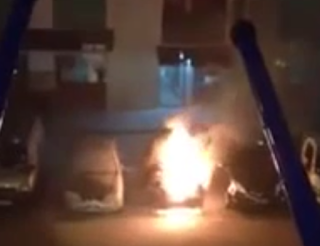 In a video, a raging fire can be seen, while SCDF officers fought to keep it under control. A video was sent in at 2.30am that a vehicle exploded in a HDB Carpark in Singapore around 1.30am. Cause of explosion is still unknown and police investigation in on-going. Car Explosion | Wah Lao Eh! In other words, once a vehicle's on fire, any number of additional factors can (and will) complicate things. Knowing what those factors are can potentially help a car owner avoid a dangerous situation, but there are no guarantees. And the most important thing to remember is that once a vehicle is ablaze, it really doesn't matter what caused it -- your car is on fire. Don't worry about whether the engine was overheating or what fluid you might have spilled (although that information might be useful later, for insurance purposes or to help an auto manufacturer fix a potential flaw). Right now, it's imperative that you get out fast and get as far away from the car as possible. A small car fire isn't going to stay small for long, and any combination of the initial causes (or complications) we'll discuss in this article will quickly make the situation much, much worse. The National Fire Protection Association (NFPA) says that vehicle fires account for about 20 percent of all reported fires, so it's worth knowing how to reduce some of the risk in your own car or truck [source: Chandler Law Group]. Artificial Chin Chow 仙草 (Grass Jelly)?